Posted on 20, June 2016 by EuropaWire PR Editors | This entry was posted in Healthcare, Non Profit, Transportation & Logistics, United Kingdom and tagged ABP, Dame Pamela Shaw, Sheffield Institute for Translational Neuroscience, SITraN. Bookmark the permalink. LONDON, 20-Jun-2016 — /EuropaWire/ — ABP has presented a cheque for more than £15,000 to the Sheffield Institute for Translational Neuroscience (SITraN). The facility, which is located on Glossop Road in Sheffield, is the first European Institute which has been purpose-built for clinical research into Motor Neuron Disease (MND) and related neurodegenerative disorders such as Parkinson’s and Alzheimer’s disease. 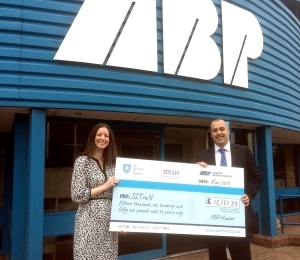 SITraN was chosen as ABP’s charity of the year for 2015 alongside Hull man Carl Giblin, who was diagnosed with MND in 2013. Former ABP Director Nick Palmer was also diagnosed with the disease in 2006. Nick sadly passed away last year. “ABP has raised money for MND before, following the diagnosis of former Grimsby and Immingham Director Nick Palmer in 2006,” said Mark. “Carl Giblin was selected as a fitting recipient by staff, and we decided we’d like to also donate some money to the Sheffield Institute for Translational Neuroscience, which does truly fantastic work in the field and has helped both Carl and Nick. ABP handed the Institute a cheque for more than £15,000 following a year of fundraising, which included cake sales, sponsored walks, a golf day and a marathon 200-mile cycle ride from Hillsborough in Northern Ireland with Green Port Hull main contractors the GRAHAM Lagan Construction Group Joint Venture, to Grimsby. Dame Pamela Shaw, SITraN Director and Pro-Vice-Chancellor for the Faculty of Medicine, Dentistry and Health said: “On behalf of everyone here at SITraN I would like to say a very big thank you to all the staff, customers and supporters of ABP for their remarkable fundraising efforts. This generous gift will make a real difference and help us to accelerate our research and the development of new treatments for patients.